2011 Roehr eSuperSport. Picture credits - Roehr. Submit more pictures. The eSupersport is the entry level of electric sportbike performance. Although it is entry level, it is first and foremost a sportbike, as such, it is equipped with quality suspension, brakes and running gear. Driveline: Single speed direct drive. Ratio 12:60. Frame type: Steel twin spar beam frame with integral motor and battery mounting substructure. Comments: Large format, cylindrical LiFePo4 battery. Capacity: 5.8 Kw/h. 96 Volts/60Ah. 600 amps (continuous) 900 amps (max). On- board 15 amp charger. Also called eRoehr eSuperSport. Ask questions Join the 11 Roehr eSuperSport discussion group or the general Roehr discussion group. Bikez.biz has an efficient motorcycle classifieds. Ads are free. 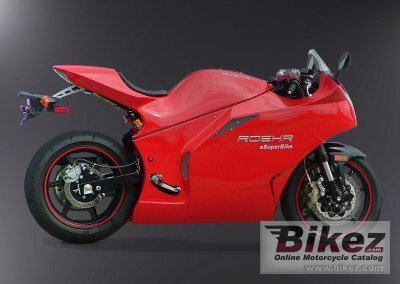 Click here to sell a used 2011 Roehr eSuperSport or advertise any other MC for sale. You can list all 2011 Roehr eSuperSport available and also sign up for e-mail notification when such mopeds are advertised in the future. Bikez has a high number of users looking for used bikes. Before you buy this bike, you should view the list of related motorbikes Compare technical specs. Look at photos. And check out the rating of the moped's engine performance, repair costs, etc.